Entitled Burglar Barges Into Home, Gets Shot, Cries "Daddy!" We could write articles about holsters every day. There are thousands of options and everyone has a strong opinion on what is best, but it’s mostly about personal preference. What seems to be making a run for its money lately, is the belly band. The belly band is an on-body carry system that has a ton of versatility with a good amount of variety. Basically it’s made of an elastic (usually surgical grade) with sewn in pockets for holstering your gun, magazines, phone, etc. and is ambidextrous. It can be worn inside the waistband, outside the waistband, cross body, center line, at any o’clock position or under your arms for a shoulder holster. 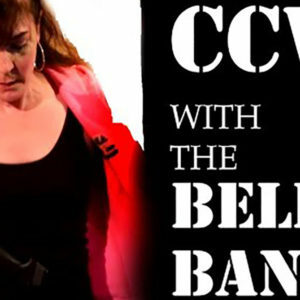 Most often, I wear the belly band with skirts or unstructured pants, those with no belt loops or made of soft composition, that make it impossible to wear a traditional IWB holster. And they’re really comfortable. Since most come with a long piece of Velcro on the ends, it’s easily adjustable to fit nearly any size. Some do come with hooks and eyes for attachment, and many people like this idea, but those can be cumbersome and not allow for just a perfect fit like Velcro will. You can find them in just elastic, or covered nicely with some lace. Some have boning attached to give it more structure and less “flimsiness.” The new one out by CrossBreed actually has a kydex holster attached to their belly band. That one doesn’t lend itself as nicely to concealment as a standard belly band, though. When you’re selecting one, look for one that has a width of at least four inches. Once you holster a gun into it, based on the size and weight of the gun, the gun can wobble while holstered because the elastic is, well, elastic. There are even wider ones available, up to eight inches wide. Some are lined, some are not . Those that aren’t may lend themselves to more of a sweat factor, so you’ll may want to wear an undershirt. Others do have a nice sweat-proof lining, so look closely at the descriptions before you purchase one, depending on your comfort level. Many will come with a retention strap, but they’re easily removable. I’m not personally fond of those straps. They create an additional layer of interruption of drawing your gun. One more thing to fumble through in a critical situation. I have removed mine from my bands and have had no issue with retention or wobble. As with any holster, be sure your gun fits snuggly and that the trigger guard is completely covered. What I don’t like about the belly band is reholstering. Unless you have one with Kydex inserts, you’ll be forced to use two hands to return your gun to the holster. It also means that you are going to be more likely to flag your fingers in the process if you’re not extra careful. Another drawback is your clothing choice. What makes a belly band really concealable can also be what makes it slow and cumbersome to draw from. Let’s say you’re wearing a button-down shirt and dress pants with the shirt tucked in. drawing in that situation could get messy unless you’ve practiced. Perhaps you’re wearing a pencil skirt. The belly band will be the perfect system in that situation in terms of concealment, but not so perfect for quick access, because of the higher waist band. Choose your clothing wisely with carrying in mind. The onus is on you to be both proficient and efficient with your carry system. 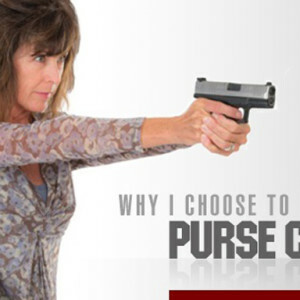 Generally, the conventional wisdom is to use the same holster, same gun all the time. For women, that’s not always realistic. It just isn’t. 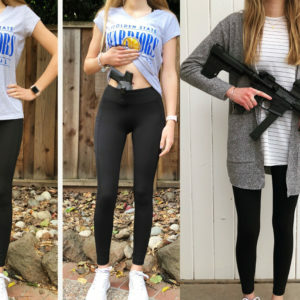 We are going to need to wear clothing that forces us to use a super slim gun and a perhaps move to a belly band. 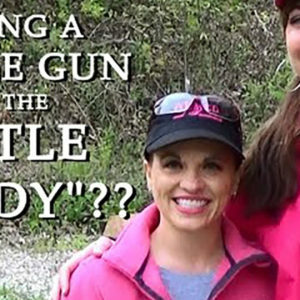 In certain situations, if I have to be dressed-to-the-nines, my husband becomes my holster. If he’s wearing a suit, and I’m in a gown, then he may be carrying for both of us, as I’m not a concealed carry purse kind of a gal. So, the belly band is a very convenient option that has been embraced by both men and women in recent years. Carry systems have really evolved over the last few years, and belly-bands are a pretty ingenious option. 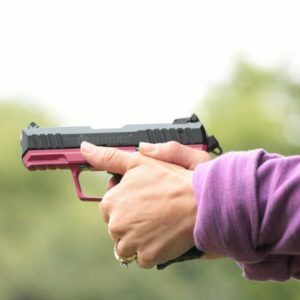 Whatever system you choose, make sure your trigger guard is covered, the gun doesn’t move and that you can be efficient and safe in the draw.